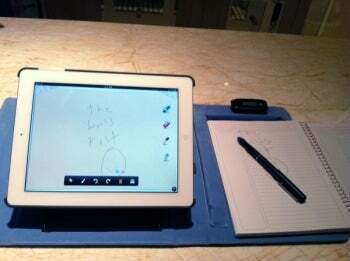 So Targus, which has never met an iPhone or iPad accessory it didn't like, is coming out with a pen and Bluetooth transmitter that uses infrared technology to capture whatever you write (no special paper required) and display it on an iPad screen--either in real time, or, if the iPad isn't handy, later on when it is. Targus showed a prototype of what it's calling iNotebook at CES. It's far from a finished product, so we can't assume that the pen and receiver (about the size of a typical USB thumb drive) will look like they do in the demo, but here's a little video that gives you a general idea of how it all works. The iPad is running an app that will work with the hardware, and also lets you fiddle with the captured handwriting (for example, you can erase it). The dongle on the upper right tracks the pen using infrared technology and transmits the captured handwriting in real time via Bluetooth; it can also store it in memory for transmission later on. Targus sees the gadget, which will come with an iPad case, as ideal for note-takers who don't want to accumulate reams of paper--students, maybe. The company hopes to ship iNotebook around mid-year with a price tag of $150.